Because kids tend to eat food and inevitably that food will run out, you’re gonna need to go back to the grocery store at some point. Sigh, here we go again. The parking spot deemed for “new and expectant moms” seems like a gem in the jungle known as the grocery store parking lot, but that light dims out for most of us pretty quickly when we are no longer expectant or new at this gig. Oh yes, there are moms that push the limits and lay claim to this spot even when they no longer look like they should be in the delivery room or are carting the infant carrier that weights 10 times the infant inside. I’m looking at you lady with the teenagers! While I cannot even begin to imagine the trials and tribulations you are going through with your hormonal, eye rolling, One Direction lovin’ babe on the brink of puberty, unless you are going to strap that tween into an Ergo and wear her through the store, get out of that spot. Sometimes I can hear my Dad barking at me “Don’t park next to the cart corral because some idiot is going to hit you.” Well, Dad, I’m sure those cart wielding idiots will do a lot less damage to my car than my children do weekly to my sanity while grocery shopping. Dings and dents are aplenty on my sweet ride but it’s no skin off my back because I was able to easily load up the kids and rush to the deli section where free samples of cheese and ham will keep the kids entertained just long enough for me to sprint through the bread and milk aisle. Grocery shopping is hard enough with kids, your parking spot shouldn’t be. So enjoy my sweet spot. Unless I’m at the store. In that case…beat it! That was my fave spot, too, when my kids were younger! Anna I still like parking by the cart corral – makes returning the cart so much easier! 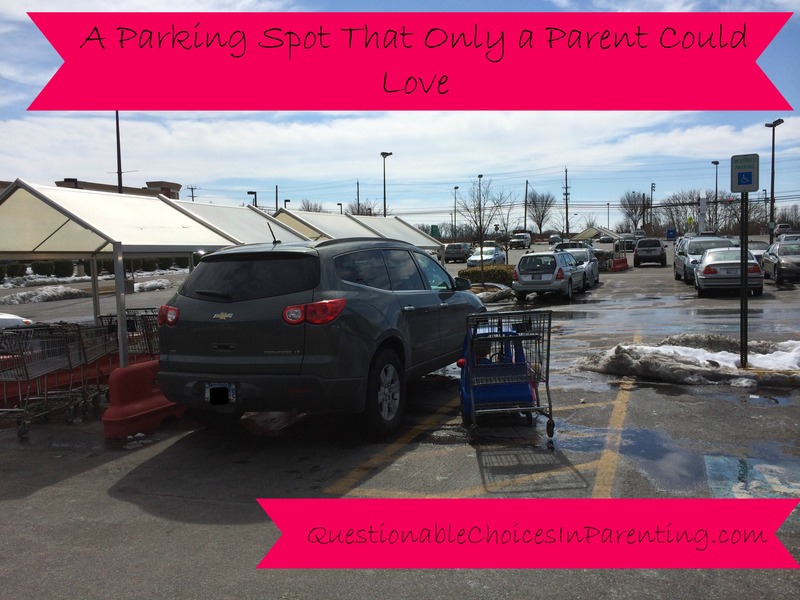 Love that Chevy Traverse and I love parking near the corral – especially with four kiddos! Unless I have my mom (then we park in handicap) I park near the cart corral. I think it is very handy. With three kids, ages six and under, I park by the cart corral EVERY CHANCE I GET. It’s a super sweet day when there is a cart waiting for me there. That spot definitely has the added bonus of being next to a handicapped spot too for extra room! The store we always go to always have the mother and baby and handicap spots right at the front and near the cart bit but also there is other cart places around the car park which you can park next to.I do not like parking near them as people hit our car before and it annoys me that they can not be more careful plus where ever you are parked the cart bit is only a few spaces away. I can’t imagine having to deal with all of the issues that you mention but I do know the trials of finding just the right parking space. It’s so hard to find even with us non parents. I have never thought about parking next to the cart corral! I love it when that cart is right there waiting for us! I don’t use them anymore, but in the past, oh boy! I used them a lot and it made life a lot easier if they were in the corral already! Nothing beats a great parking spot at the Grocery Store. I don’t care where it is or what it’s next to, but if it’s close to the door. I’m taking it! Only one problem babe! People don’t care about hitting your car anymore. They throw their carts into the bin with no care. I remember our car being scratched from parking next to the shopping cart bin. We park almost near the back now…where there is no car on either side. I am sick of the lack of respect when people open their cars. WHAM! right into our door. Shucks! And usually it is the kids who don’t know what paying for a car means. I’ve been in that parking area! I recognize it as the generic parking area near every supermarket I have ever been to. I love a close spot but I will not wait all morning like some do to get one! Oh my goodness, yes! I alway park by the cart return no matter how far away. And when there is a handicapped space next to it with more room, even better! Ha, now that our little one is here…..I totally get the importance of a good parking spot! It makes errands a million times easier! I like parking there too. It’s just so convenient and there’s no hunting for the cart corral. In the winter when there’s snow and ice on the ground, it’s even better to park next to it! Ah yes too true. It’s never a good idea to park by the carts. That worries me and I have an older car. When it comes to parking a lot of people try to get as close as possible to the store, I don’t care where I park as long as I get into the store and grab what I need I’m happy. I never take all three boys grocery shopping with me. The store is always packed and I am lucky if I am able to get a spot somewhere other than at than the furthest away from the door possible. This cracked me up because my brother-in-law recently told me he never parks anywhere near the cart corral because he didn’t want his nice truck to get bumped. For me, this is the prime spot! That is a sweet spot. We have one like that at a local WalMart. I look for the spot every time. HIlarious! I will make sure to leave that spot for you wherever I am! I’d have to agree with your dad, i go out of the way to find a spot away from others or that has one side that wont have cars. Ha! This is hilarious, I always try to park next to the cart thingy because it’s more convenient. I always park near the corral too! My husband can’t stand it because he thinks someone will hit my car with a cart… but it’s just too convenient! I think I’ll leave that spot for you then 🙂 We always avoid it for the same reasons your dad pointed out. I always take the first spot I see. It always amazes me how long someone will wait for the perfect spot. By the time they get it I am already in the store and halfway done with my shopping lol. I like parking near the cart corral. It’s especially helpful if it’s raining, so you don’t have to go far to return the cart. So true. Even when the kids aren’t with, being by the cart corral is a must if it’s raining so you can get in the car quickly. We call it the sweet spot too!!! Sing it sistah!! What a great parking spot! I also appreciate that extra space next to the handicap spot. Even when I was preggers, or had the infant seat, I never got to park in that special spot. It was either full or the store I was at had not yet deemed it necessary to have such a spot set aside for Moms. I did try to park either as close to the front door of the store or the cart corral. 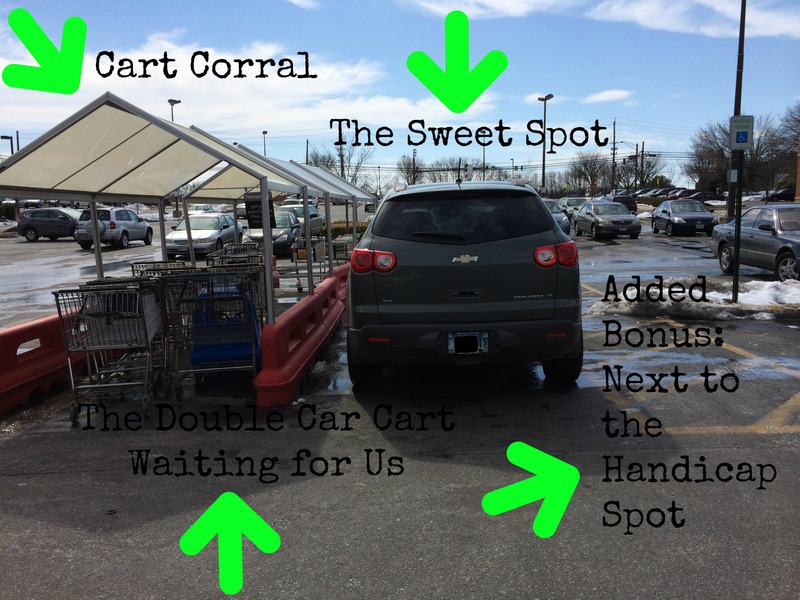 I still do – even if the cart corral is 12 million miles from the front door, which I still cannot understand. Who is in charge of where, strategically, to place cart corrals when designing the parking lots of stores? I want to speak to that person. This is definitely a spot for me! I always look for added handicap space so I can get the kids out without being squished! This just made me realize I will have so much more to think about when I have kids! Right now I just park anywhere and don’t think twice. That is a prime spot! I have a 12 passenger van and loading 5 little ones in and out of it is a big task, I am always looking for the prime spot too! It really doesn’t matter where you park. Some idiot is still going to hit you, lol. The double cart! That thing is a must have, especially if it is decked out like a race car or fire truck. Isn’t it amazing the things that make you happy once you’re a mom. There’s a mall her in L.A. that has parking spaces up front reserved for families with small children. LOVE! You are so right about this! I always love a spot near the cart return! I see now parking spots for cars with small children, which is pretty cool. It is hard work getting the kids out of the car, especially in the winter. I usually park where ever there is shade. If it’s raining, I just park the closest I can get to the store. So true! I actually love the spot directly across from it, that way it’s close enough, but my car doesn’t get dinged! LOL I know right?! I always look for the space closest to the carts versus closest to the door! I get really paranoid with dings. My husband would not be happy, that’s for sure. But I actually don’t mind parking far away because it’s just forcing me to get a little more exercise in. ITs always an adventure when I go shopping with my kids. One day I will look back and miss the chaos. I always always park whereever the first parking spot I can find is LOL. Unless there is a cart next to it. I often park next to thr cart coral. Mostly because I hate having to walk to put the cart up after the car is loaded. Haha! I thought it was just me! I never parked next to the corral pre-kids, now it’s like hitting the lottery when I can park there!